Protect your CD, DVD, and USB Project files from unwanted attacks. Protect your files from alteration and manipulation. Protect your linked programs from malware and viruses. The add-on program KSSW-Archive protects your files from unwanted attacks. The files are encoded in an archive file, similar to Winzip. The files within the archive can be linked to any of the Front End Menu buttons. The files can also be unpacked to a file of the user's choice. The KSSW Archive Software user interface resembles the well-known and well-spread program Winzip, and is intuitive to use. The Archive Software can be started directly from the Menu Bar. Select "Add-on Software - KSSW Archive" on the Menu Bar. In the KSSW Archive Software, choose "Archive - New Archive" from the Menu Bar. Then choose the destination folder for the files and give it a descriptive name. Files can be added to the main window from Windows Explorer using drag & drop. Windows Explorer can be started by selecting "Drag&Drop - Windows Explorer" from the Menu bar. Note: It is possible to select multiple files at one time. Files can also be added by selecting "Add File". From the Menu Bar, select: "File - Add File...". Note: It is possible to select multiple files at one time. In order to verify the storage status of an archive, choose "Archive - Archive Capacity" from the menu bar. A dialog box will the show the maximum and current values. From the menu bar, select "Action - Password Encode Files......". Enter your password. After saving the archive, the files will be protected with your password. Use the same password for all archives. Place the password request in the menu start. In the menu bar for Front End Menu Creator: "Properties Menu - Access Control"
Change the setting to "Password Required" and use the same password here as in all of the archives. This will make it so that this password will be used for opening an archive file. Select "Archive - Save Archive" from the menu bar. 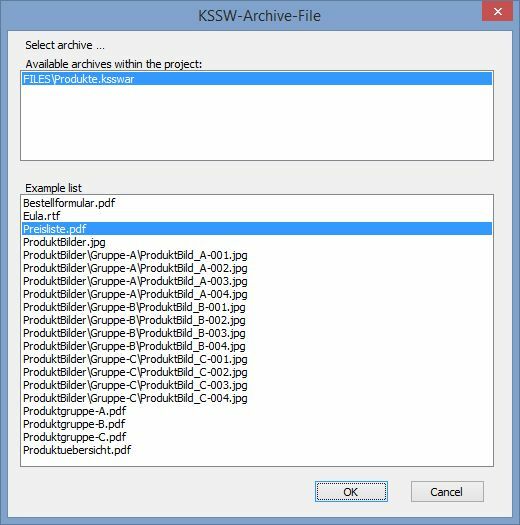 After saving, closing the KSSW-Archive Software and move or copy the archive file into your Front End Menu Project folder. In the Front End Menu Creator, place a button in the menu window, which will open the properties dialog box for the button. Click on the "Link Properties" tab (1). For function, select the function you want it to perform. If it to start a program, you should select "Start an executable program", otherwise, "Open a file" (2). Click on the browse-button [...], to the right of the document or program field (3). 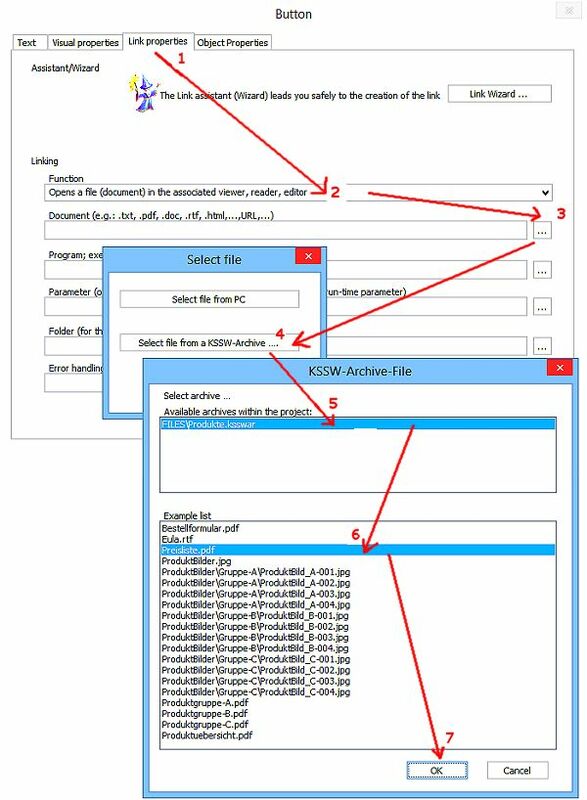 In the "Select File" dialog window, click on "Select a file from an archive…" (4). This will open a new dialog window. Select the desired archive on the upper list box (5). Select the desired file on the lower list box (6). Select "Ok" to close the dialog window (7). Drag the archive file (.ksswar) into the Front End Menu Creator menu window from Windows Explorer using drag&drop. This opens a dialog window to select a file from the archive. Select the desired file and click "OK". A wizard automatically creates a new button linked with this file. 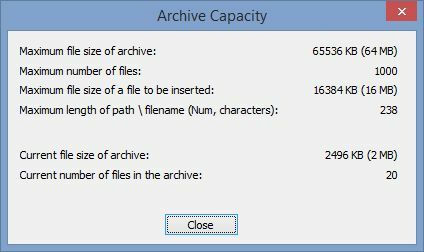 Dialog Window for selection of a file from a KSSW archive. In the Front End Menu Creator, click on the "Archive" button. A dialogue opens for entering the required parameters. Setting Dialog for entering unpacking parameters.